Rarely do I want to use hairspray on my eyes as much as my hair – not that I use hairspray in my hair – but this first photo for Lifetime’s The Unauthorized Full House Story has me questioning whether my eyesight is all that important. Check out this ever-so-awkward first image from the TV movie below, and try to make it through the afternoon without the tortured screams of Popeye impersonators calling you down to Hell. 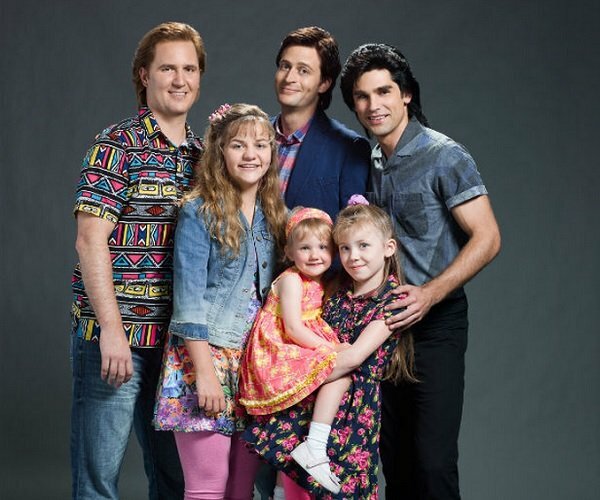 There are so many words and feelings and bile-uprisings that this picture inspires, and I’d be lying if I said it makes me not want to watch The Unauthorized Full House Story. Because now, all I want to do is watch this movie. On a couch upholstered to look like Joey’s shirt and DJ’s skirt thing. I could probably talk in frightened half-sentences about this picture all day – Uncle Jesse is like 20, and wha… – but I guess I could go into who all of these actors are that are portraying the goofily saccharine Tanner family and their real-life counterparts. According to The Wrap, the role of Bob “Danny Tanner” Saget will be played by Garrett Brawith, most recently seen in B-movies like Poseidon Rex and Jurassic City. Donning that colorfully hideous shirt is Death Race’s Justin Mader as Dave “Joey Gladstone” Coulier. John “Uncle Jesse” Stamos will get his heartthrob looks from recent Days of Our Lives vet Justin Gaston. Candace “D.J.” Cameron will be played at different ages by Rogue’s Brittney Wilson and newcomer Shelby Armstrong. The other young actresses will also get the age-gap treatment, with Jodie “Stephanie” Sweetin being played by The Returned’s Dakota Guppy and Jordyn Ashley (Supernatural). Mary Kate and Ashley Olsen (who both played Michelle) will be portrayed by twin sets Blaise and Kinslea Todd as the toddlers, Calla and Tyla Jones at age 6, and Kylie and Jordon Armstrong at age 9. The characters that didn’t make it into the image above are Lori “Aunt Becky” Loughlin, who will be played by Big Eyes’ Stephanie Bennett, and Andrea “Kimmy Gibbler” Barber, who will be played by Finding Ms. Claus’ Aislyn Watson and Twisted Tales of My 9 to 5’s Jaime Schneider. Does that mean we won’t be seeing Steve or Vicky or any of the other side characters? Sure, we have a whole new version of Full House to look forward to coming to Netflix next year, but that’s a completely different monster. The new show can’t properly deliver awful hair and fashion in the same way this Lifetime movie can, which is admittedly both a blessing and a curse. Lifetime, which already gave us the monumentally ridiculous The Unauthorized Saved By the Bell Story, will premiere The Unauthorized Full House Story on Saturday, August 22, at 8 p.m. ET. Viewing parties need to happen, people.